First of all – HAPPY NEW YEAR! I hope you all had a fantastic night to ring in 2019. I will be honest, I was at home working hard on the game, but I did get up at midnight and give the family a kiss and take a moment to reflect and be thankful for a great year in 2018. 2018 will be a hard year to beat, but I’ll be darned if 2019 isn’t going to be amazing too. 2019 is the year Metropolisim will launch into Early Access and you will all get a chance to play it for yourselves. I am still working on an exact date when that will be happening, so more to come on that. But before we get to that point I still have lots more development diaries planned with information to share about the game. The next development diary will be coming in the next two weeks (mid January or so) so please look forward to that. Dev Diary #3 will be focused on citizen pathfinding, movement, and public transport usage. It will most likely contain a video so you will get to see the game in action. Right now I am trying to polish a few of the systems that serve up that functionality as well as the UI so I make sure that when I show you guys the game it is up to my standards and the standards you all expect and deserve. Also, dig into their current mood. On some of the hidden tabs will be more really in-depth and exciting things like their income, details about their family, etc. 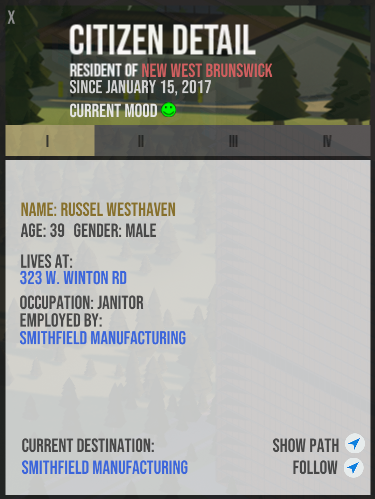 So excited with how much detail and interaction I’m going to be serving up and putting at your fingertips when it comes to the residents of your cities. I know a lot of you have been asking questions in the forums and I haven’t been able to respond lately. WIth the holiday season and everything going on I haven’t had time to do much, and what free time I have I spend working on developing the game. I promise I will be jumping into respond to as many of you as I can in the coming weeks. Thanks again for following the development of Metropolisim and I look forward to sharing more with you soon. Wishing you the best in the coming year. when is this coming out….???? Early Access scheduled for September, 2019. You can Pre-Order now for closed beta access prior to that. Definitely interested in testing the beta. Love the UI and flat color design! I love your attention to detail, and will be watching this game very closely! – A “civic” zone, which is essentially government-owned land. These zones could be turned into anything: police, fire, health, education, parks, etc. Civic zones would allow players to plop buildings and props to assign the land into whatever function they choose. That way, they can design unique parks (adding grass, paths, seats, ponds, public art, parking, trees etc) or other buildings to help individualise the city and prevent too much repetition. After all, in a real city not every police station looks the same. – I think I read something about procedural generation. If so, have you considered some of the design elements used in real cities, like floor area ratios, floor height ratios or setback limits? Even putting in height limits (eg. single storey vs ten storeys instead of low, middle and high density) can make the simulation more realistic. – Will you be making train and subway stations modular? One of the big criticisms I have with un-modded Cities Skylines is that subway stations have only two platforms and one entrance. Putting down multiple entrances (perhaps within buildings), then separately putting down however many underground platforms you want, then joining them up via underground walkways would be a great addition. – What about specific tax breaks for certain businesses in certain areas to create specialised districts? Some cities do this to encourage development of “eat streets”, night club areas or clothing districts for example. Might help the player create some uniqueness in their downtown, particular as the city gets bigger. Anyway, game looks great! Looking forward to seeing more of it. Should we be expecting Dev Diary #3 soon?